Grab your free sample of Dove Men+Care Clean Comfort Dry Spray! 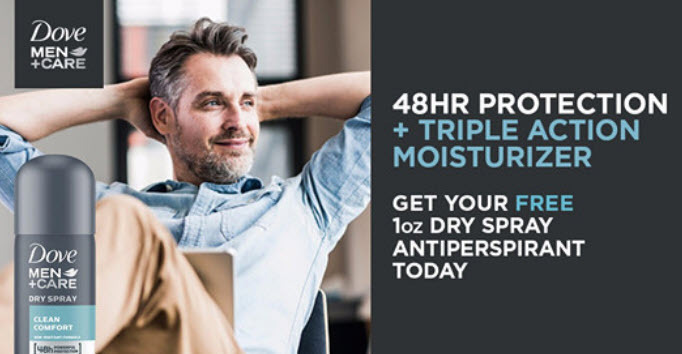 Dove Men+Care men stay fresh all day with 48 hour sweat and odor protection that goes on instantly dry. This mini deodorant dry spray offers the same 48-hour powerful sweat and odor protection as full size: ¼ moisturizer technology helps protect skin against irritation, clinically proven non-irritant formula, goes on instantly dry so you can easily apply while on the go, on-the-go size underarm deodorant dry spray for men with clean, crisp scent.